Physician quality programs are expanding as the shift to collaborative care, outcome-based payment and new benefit designs transforms how healthcare is delivered and paid for. Billing companies must assist and guide their clients to ensure successful participation. If not, the client and the billing company will see financial consequences. The majority of arrangements continue to be based on fee-for-service; however, evolving payment models are moving toward various levels of providers' risk using capitation, episode-based payment, or global payments. Physicians need to understand how the programs are measured and how each measure is calculated. It is also important to understand the contracts and program methodology documents for quality and cost performance measures. The Physician Quality Reporting System (PQRS) began in 2007 as the Physician Quality Reporting Initiative (PQRI). It started as an incentive-based reporting program for eligible providers (EPs) to report quality data to the Centers for Medicare & Medicaid Services (CMS) via claims. In past years, physicians could earn incentive payments for successfully reporting quality data, but physicians are now subject to a penalty ("payment adjustment") if they fail to successfully report. Physicians' payments will be reduced by 1.5 percent in 2015 if they did not successfully report quality data for their 2013 services. The payment reduction increases to 2 percent in 2016, based on reporting for 2014 services. For successful reporting on 2015 services, physicians must report on at least nine measures. If nine measures are not available, the EPs must choose all that are applicable. The measures must be across three National Quality Strategy Domains. Practices must report each measure for at least 50 percent of the Medicare Part B fee-for-service patients seen during the reporting period. Additionally, if the physician sees one or more Medicare patients in a face-to-face encounter during the reporting period, the physician must report on at least one of the "cross-cutting" measures, which are nonspecialty measures, such as influenza immunization. The cross-cutting measure can count as one of the nine required measures. Measures with 0 percent performance rate will not be counted. Most small physician practices participate in PQRS by submitting quality codes on individual Part B claims. The quality codes are comprised of CPT Category II codes – "F" codes – and HCPCS Category II codes – "G" codes. For detailed information on measures by specialty, review the PQRS Measure Specifications Manual, which indicates which quality data codes should be used for each measure. The Qualified Clinical Data Registries (QCDRs) have received a lot of attention. These registries are different from the regular "qualified registry" option because they use non-PQRS measures and require reporting on all patients, not just Medicare. Specialty-board and society-clinical-data registries would qualify as vehicles for participation (e.g., Society of Thoracic Surgeons National Database or ACR). In some cases, this will allow the provider to meet requirements for board maintenance of certification and PQRS simultaneously. Additionally, CMS stated in the 2015 Medicare Physician Fee Schedule Final Rule that it intends to eventually eliminate claims-based reporting. The Affordable Care Act mandates that CMS apply a value-based payment modifier (VM) to payments by 2015 for groups with 100 or more eligible providers (by tax ID number). The requirement will apply to groups with 10-99 providers in 2016 (based on 2014 PQRS reporting), to solo practitioners and groups of 2-9 in 2017, and to nonphysician practitioners in 2018. The VM will assess a cost composite score, which equals the total overall costs plus total costs for beneficiaries with specific conditions. The program will assess quality indicators for clinical care, patient experience, patient safety, care coordination, and efficiency. There are many details related to the program that must be finalized and communicated to the healthcare industry. 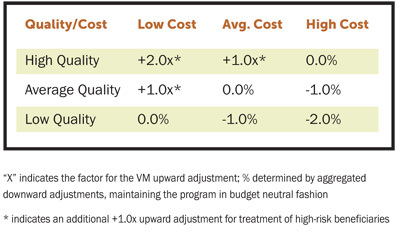 It appears that the overall goal of the VM program is to calculate a cost composite score plus a quality composite score to equal the value modifier amount. 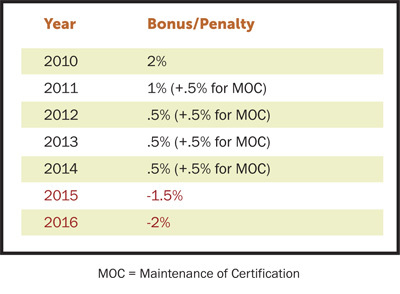 Groups that are subject to the VM in 2015 that did not successfully participate in 2013 via GPRO will receive a 1 percent penalty (in addition to the PQRS penalty). This is not related to the CMS EHR Incentive Program (Meaningful Use). If the qualifying group (100+ EPs) participated via claims reporting and not the GPRO option in 2013, they will not avoid the penalty in 2015. PQRS is the basis for VM, so the penalty will be based on PQRS measure performance rates of group practices and eventually individual physicians. For 2015, those groups that participated in PQRS can choose to have their "value modifier" at a level of 0 percent or to potentially receive an upward or downward adjustment through quality tiering. Quality tiering is a voluntary option under VM that allows group practices to earn a bonus or be subject to a penalty for their group's performance on quality, outcomes, and cost measurements. The program is budget neutral, so if some physicians/groups get more, some must get less. As with PQRS, the stakes for VM are rising. Groups of 10 or more that do not meet requirements for satisfactory PQRS reporting for 2015 services will be subject to a 4 percent VM payment reduction in 2017. Also, under the quality-tiering mechanism, groups of 10 or more will be subject to a 4 percent payment reduction if they have low quality and high cost, or 2 percent if they have low quality and average cost. Likewise, groups with favorable quality-tiering results will be eligible for a 2 or 4 percent payment increase. The VM must be implemented for all physicians by January 1, 2017. But there are some exceptions to the VM program. For example, the program does not apply to payments that are not made under the Medicare PFS, such as those to rural health clinics, federally qualified health centers, and critical access hospitals using method II billing. For 2015 and 2016, the VM does not apply to groups in which any of the group's physicians participate in any of the following programs: Medicare Shared Savings Program ACOs, Pioneer ACO model, or Comprehensive Primary Care Initiative. Many commercial payors have already implemented quality programs, so it is critical that you understand which programs your clients participate in and which ones are on the horizon. The focus on quality will only increase, so accurate compliance is critical for your clients and your company. Melody W. Mulaik, MSHS, is the president and co-founder of Coding Strategies, Inc. and Coding Metrix, Inc., located in Atlanta, Georgia. She is a frequent speaker and author for CSI and other nationally recognized professional organizations and publications.